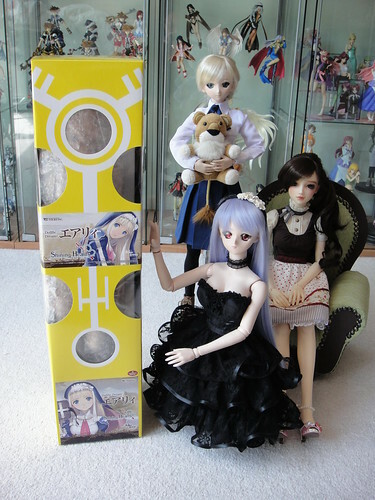 My Newest (Yet Oldest) Doll – Welcome Yukiko! My sister recently completed a Volks old resin kit called Miisha for me. It was first released in 2001 and after a bit of searching I was able to acquire one that had never been opened! 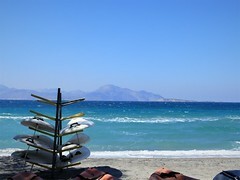 It was quite a labour of love to assemble her and was much more work than we originally anticipated! 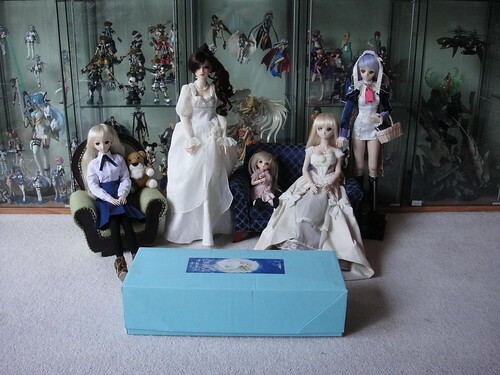 She did an amazing job, and when she brought the doll over today all my girls came out to greet her. If you’d like to read about how she was put together, check out my sister’s blog about it here. 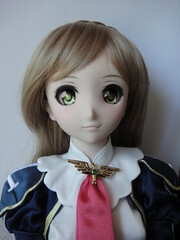 It’s really very interesting to read her observations about old resin vs new resin. 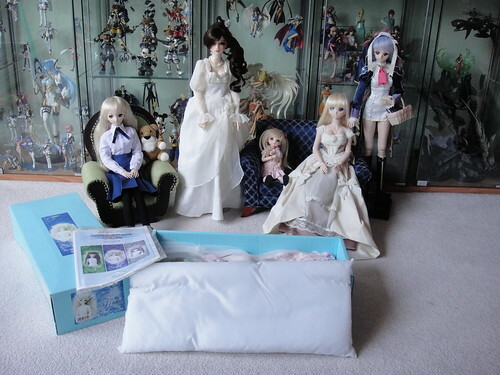 My girls are Saber Lily (Dollfie Dream, Alisanne (Volks SD16 Daria), Airy (Dollfie Dream) and Makoto (custom Dollfie Dream) and the little one is Delilah (my sister’s DollnDoll ♥ Mo). The box has aged quite a bit over time, but all of her paperwork was still sealed in the plastic when I got her! Machiko had to open it up to read the manual since there were some very strange bits and pieces in this kit that she’d never encountered before with her 2008 and 2010 Volks MSD kits. Here she is all dressed up out of the box now. 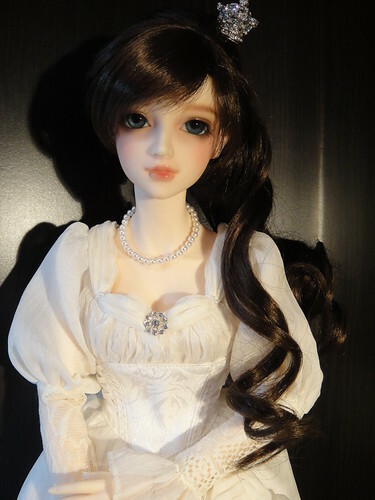 I’ve decided to call her Yukiko (雪子) which means “child of snow” to match her angelic nature. 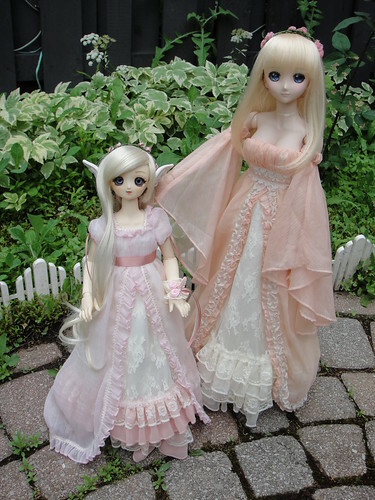 Here she is with Airy in matching outfits. They look like lovely nymphs or faeries! It’s a beautiful sunny summer day today, and Airy wanted to go outside to enjoy the weather, so I was more than happy to oblige. I didn’t take many photos of her in her default outfit when I welcomed her home last week so this was a chance to take a few photos. 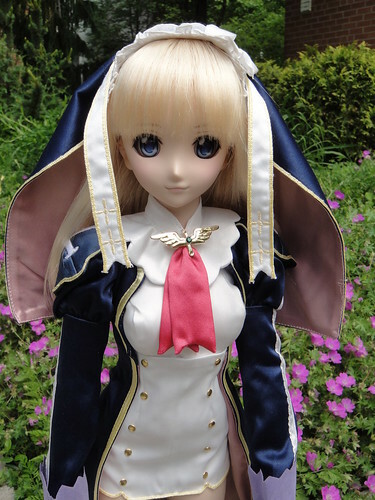 I’m really impressed with how Volks thought out the design for her outfit – for example the entire front edge of her coat has a wire in it so that you can shape it against Airy’s body to get it very form-fitted. Everything is lined in either white (even her boots!) 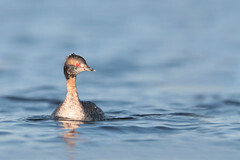 or that pretty mauve colour. 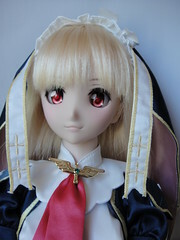 In case anyone was wondering, I took out her default eyes pretty much as soon as I got her because I didn’t like them at all. 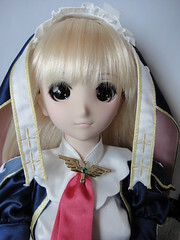 I think she looks so much softer and prettier with new animetic eyes from Volks. Sometimes, you have to just stop and smell the flowers. The breeze was picking up Airy’s veil a bit, but the fabric has enough weight to it to stay put on her head. She can stand very easily on her own thanks to her boots. 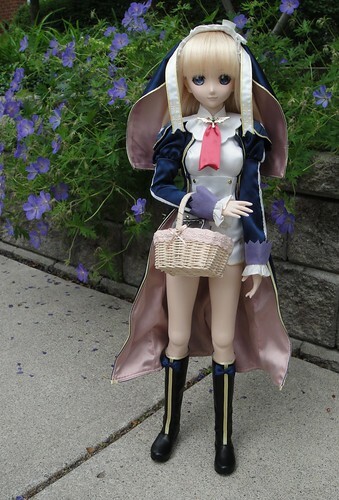 Since it’s such a nice day, Airy wanted to relax a bit so after a quick wardrobe change she was ready for a little picnic! 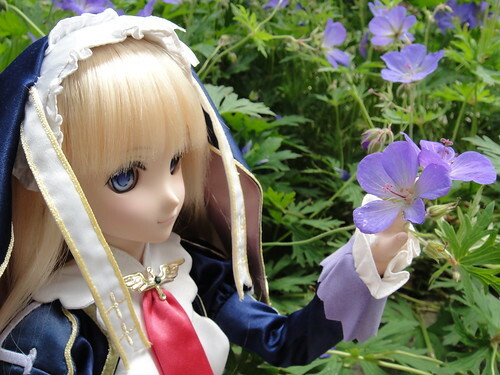 Airy looks a bit like Alice lost in Wonderland with all these pretty flowers all around her! 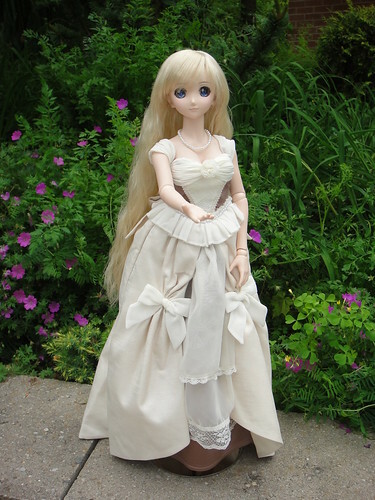 Another wardrobe change – here’s Airy looking very elegant wearing the “Charlotte Ribbon” Dress. It’s meant for SD13 dolls so the fit is a bit strange. It fits the L-sized bust at the top, however there is a lot of room around the waist. But the bustle-style petticoat gives this gown a beautiful silhouette. 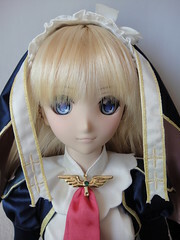 Also, she’s not wearing the the lace arm sleeves that are part of this set because they don’t fit at all since SD13 arms are …erm… fatter… than DD arms! LOL This gown is supposed to be off-shoulder but I moved the little sleeves higher to cover the shoulder joint since they were drooping down on her arms (again, DD arms are slimmer!) and it looked a bit odd. 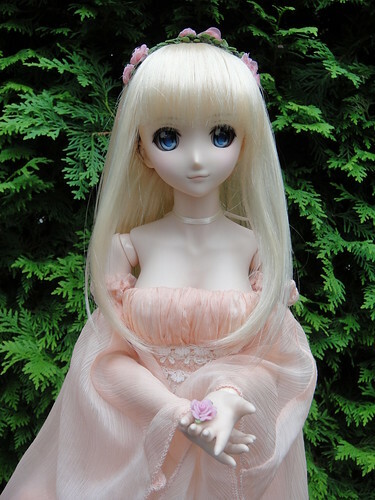 Here Airy is like springtime come alive in the gorgeous Volks Fairy Tale: Spring Pink outfit from the La Parsonal Collection that were released at the Home Town Dolpa Kyoto 8. The gown fits her beautifully, but you have to be a bit careful with the zipper at the back of the bodice where there is more fabric. The interior of the dress is lined in ivory so there’s no risk of staining. 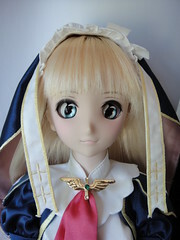 The headpiece can be worn as a garland on top of her Airy’s wig, but I think it looks a little prettier when worn as a headband and fastened behind her neck. 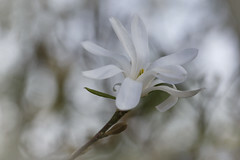 I’m loving this new girl – she’s so versatile and lovely! 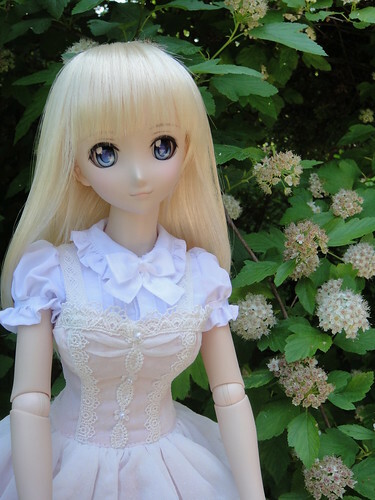 My newest Dollfie Dream – Airy! The postman came to the door with a couple of boxes for me today! Since Makoto doesn’t need to sleep, she was awake when my boxes arrived early this morning! She’s very curious as to what I’ve bought. Ta-da! 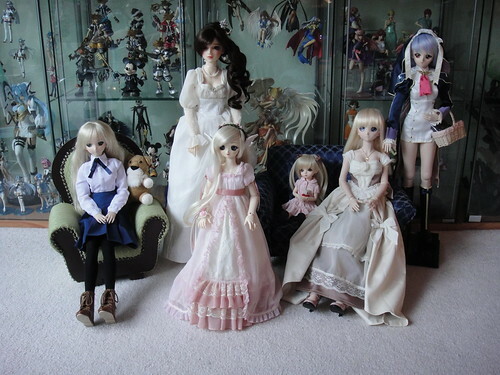 It’s a new Dollfie Dream Airy figure by Volks. 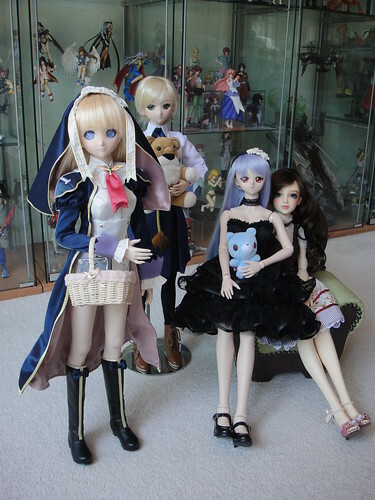 Makoto quickly rouses Saber and Alisanne to come greet our new family member. Here’s Airy fresh out of the box. Makoto lends her a Gloomy Bear to cover herself up with. 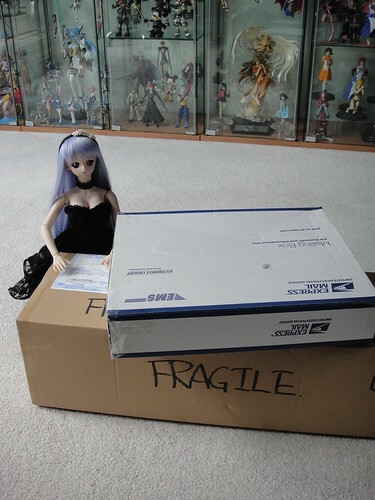 Saber is thinking that she came with infinitely more stuff! Here’s Airy all dressed up in her outfit. She looks so sweet, but those eyes are super creepy and simply HAVE to go! After a bit of work I was able to get her eyes out. 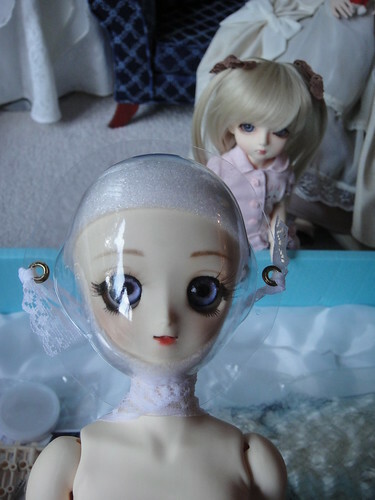 The softer vinyl made it much easier to remove her headcap and also to get the glue and eyes out in one piece by carefully squeezing the head and pressure from a metal cuticle pusher. 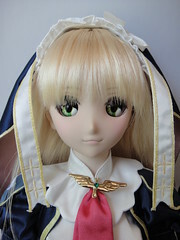 Here are some pictures of various eyes while I was trying to decide which would suit Airy best. 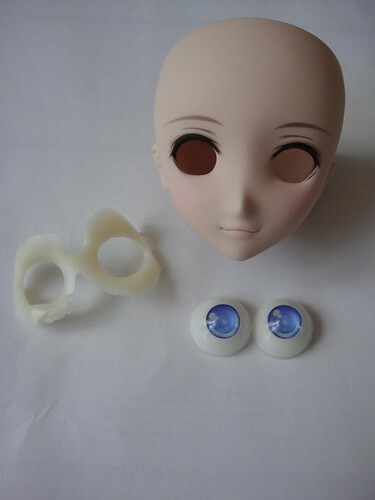 In the end I chose the Volks Animetic eyes F Type in Bright Blue (RURI)eyes. I think they really suit her. They still maintain the integrity of her character but don’t have that creepy emtpy look to them! Some stuff I bought arrived while I was on my cruise – I had it sent to my sister’s place. 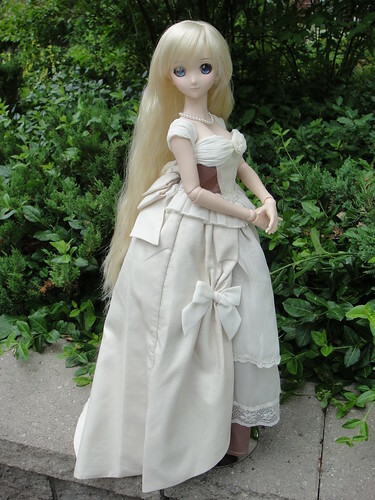 Here’s Alisanne showing off the beautiful Volks Elizabeth Rose Dress from the DP25.